Earth Diggers are able to build up and level retaining walls. Are you looking an efficient and reliable retaining wall experience? Then we Earth Diggers are the one for you. We are not mainstream retaining wall builders our professional and expert maintenance team are not only efficient at their work they are creative as well. Our team will always make sure that you will get the most innovative wall solutions. Just give us a call and we will be there at your doorstep to solve all your issues regarding the beautification of your property. Our crew members will list your requirements and will produce the wall according to your specifications on a very cost effective way, and they will ensure that it will suit your property ambiance. We offer all kinds of retaining wall programs like sandstone retailing walls, stone retaining walls , brick retaining walls, block retaining walls, garden retaining walls landscapers and many more. One of the benefits of retaining walls are they provide protection against soil erosion it holds back the soil and prevents the ground from getting washed away. 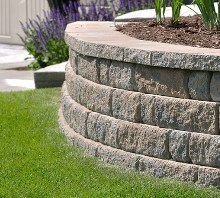 Retaining walls not only add glamour and beauty aspects to your house it increases the property value.